Since 2010 the Conservative party have handed one tax break after another to Morgan Stanley and their employees. They have slashed corporation tax for major businesses from 28% to 19% (the lowest rate in any of the major advanced economies), they scrapped the Bank Levy, and they've also lavished tax cuts on the super-rich by slashing the top rate of income tax, Inheritance Tax and Capital Gains Tax. In order to fund these deliberate handouts to corporations and the mega-rich, the Tories have loaded the burden of their toxic austerity dogma on the majority of poor and ordinary people, resulting in the worst fall in real incomes and living standards in decades and an increasingly unstable and debt-laden economy. As a result of seven years of ruinous ideologically-driven Tory austerity dogma productivity has collapsed, wages have stagnated, increases in GDP per capita have been anaemic, rates of private and public debt have soared, local governments and public services across the country are on the brink of collapse, economic demand is faltering, and public investment in infrastructure and research is the lowest in the developed world. None of these problems matter to the bankers at Morgan Stanley because they're happily getting richer at a faster rate than ever before. And after the bailouts that followed the bankers' insolvency crisis, they can feel entirely confident that if another crisis comes along, the UK government will bail out the financial sector again, and load the cost of these vast financial sector subsidies onto the public again. 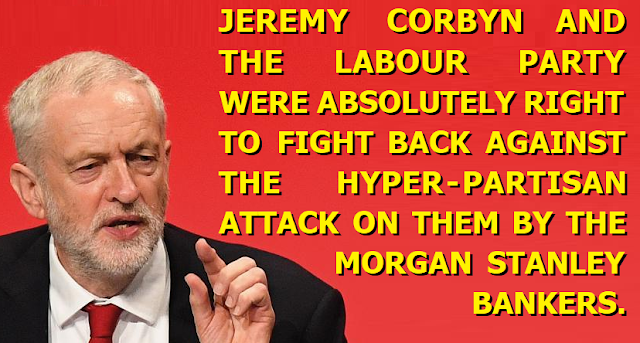 It's no shock at all that Morgan Stanley have decided to attack Jeremy Corbyn and the Labour Party under these circumstances. Engaging in partisan political attacks against the political rivals of the party that has showered you and your kind in handouts is hardly surprising behaviour. Neither is it surprising that they'd intervene in British politics to scaremonger about a party that is intent on redressing the soaring rates of inequality between the mega-rich and the rest of us. It's pure self interest at work. And why wouldn't bankers who make their £millions in fees handling private capital come out against Labour's plans to bring vital UK infrastructure and services back under public ownership so that they can be run for the national good, rather than to generate private profits? And why wouldn't a bank that stands accused of being one of the biggest global players in the offshore tax-dodging industry come out all guns blazing against a political party that actually seems to be serious about clamping down on companies and individuals who are intent on siphoning off their wealth rather than paying their fair share? Morgan Stanley provided no real evidence to back up their fearmongering that a Corbyn government would somehow be worse for the UK than a cliff edge "no deal" Tory Brexit. But this lack of justification hasn't stopped an army of right-wing astroturfers repeating this new anti-Corbyn propaganda trope all over social media and newspaper comments sections as if it was evidence-based analysis from a respected and impartial observer, rather than the self-interested speculation of a major beneficiary from seven disastrous years of Tory misrule. The reason for Morgan Stanley's overt political attack on Labour is obvious. They know that even if the Tories deliver an economically disastrous complete meltdown Brexit shambles, they'll still be able to make a killing by shorting the pound, and shorting British assets. Once the meltdown takes hold they can reinvest their winnings by gobbling up British infrastructure and assets on the cheap like vultures stripping the flesh off a carcass. They can do that safe in the knowledge that a Tory government would shower them in even more tax breaks while loading the cost of the disaster onto ordinary people with more austerity dogma, and if the worst came to the worst they know the Tories would bail out the financial sector if it all went wrong. Mega-rich bankers are being promiosed no such favours by Jeremy Corbyn, and they're deeply afraid that Labour might actually stick to their word and set about claiming down on tax-dodgers, taking control of vital national infrastructure away from private profiteers, and reversing some of the most egregious Tory handouts to corporations and the mega-rich. In the past Labour leaders might have seen this kind of overt political attack from a major bank as extremely damaging, and set about apologising to the right-wing propaganda rags and meekly prostrating themselves at the feet of their financial sector masters. But under Jeremy Corbyn they're actually got a bit of fight about them. Labour haven't responded to this politically partisan attack by grovelling and begging for forgiveness, they've stood their ground and used it as an opportunity to explain how their policies would benefit the majority, which is only really a threat only to the piss-taking minority who have got mega-rich stuffing their ill-gotten gains in offshore tax havens while the rest of us bear the brunt of socially and economically ruinous Tory austerity dogma. For far too long the Westminster political establishment have worked as the management class to represent the interests of major corporations against the interests of ordinary people, when their job should actually be quite the opposite; to protect the interests of ordinary people from the dangers of unregulated capitalism, and the unrelenting greed of the wealthiest people in society. These Morgan Stanley bankers thought that they could bully Labour into dropping the policies that made their 2017 Manifesto such a hit (renationalisation of vital infrastructure and services, Corporation Tax rates more in line with the global average, no tax increases for the bottom 95% of earners ...). But by standing up to Morgan Stanley rather than tearing up their own manifesto and begging them for forgiveness, Labour are showing that they're actually interested in putting up a fight on our behalf.